My last update was on July 2nd covering day 5, I am now on the 26th day of my trip (July 17), everything is going well and I am on the return trip, currently in Prince George, British Columbia. I apologize for the delay but the reason for such a long delay with updates is because I have been camping and usually getting to the campsite late in the afternoon or evening. 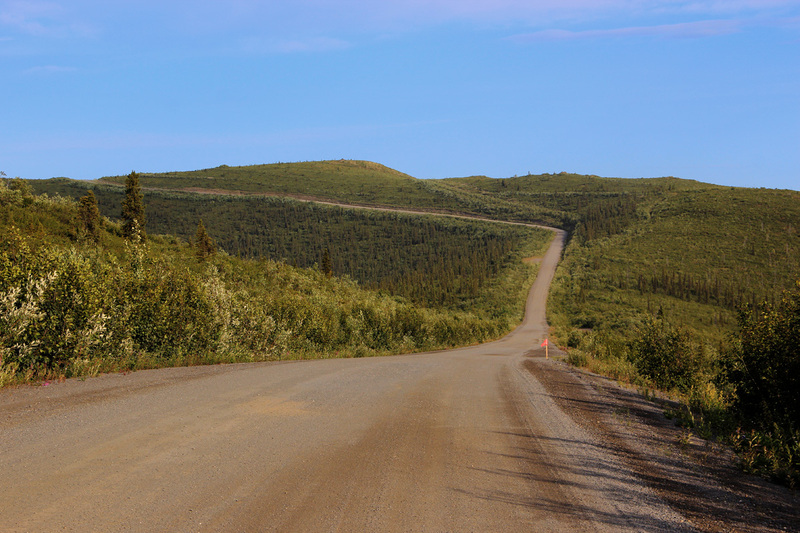 Most campsites in Alaska and the Yukon have very bad internet access if any. I have been able to upload a few pictures to Facebook so my wife can see my progress but have had no time to blog and sort through all the photos I have been taking. I don't want to only post pictures, I want to try and describe the experience, it will have to be done when I'm back. Tomorrow I head to Jasper and then Banff National Parks. I have been having lots of fun, here's a few pictures that have been posted to Facebook and a few that haven't, some of the readers have already seen the Facebook pictures. 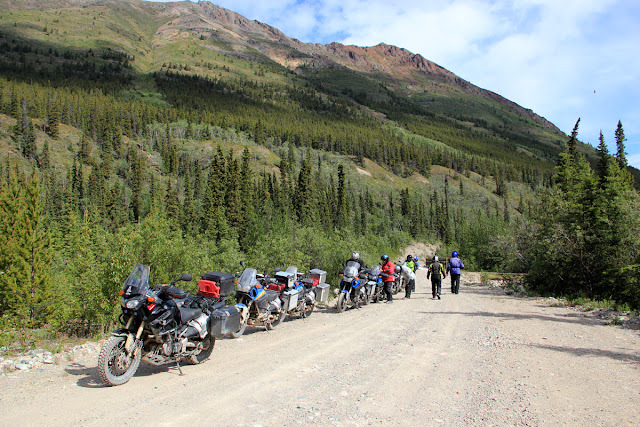 The Super Tenere gang on one of the day's trip near Whitehorse. My bike is at the center of the middle picture easily recognizable with the "radioactive" sticker on the back of the helmet. This is my kind of adventure, miles from the main road and no one in sight. I was alone on this trip. Take a look at my bike on these pictures, it will get much worse later on. Another trip with the gang but I dropped them in the afternoon and went exploring by myself. Another trip and this time I was leading a few of the guys, my bike has the red Rotopax fuel container upright. Later they decided to turn around and go looking for a place to eat, I continued by myself and had a great time. 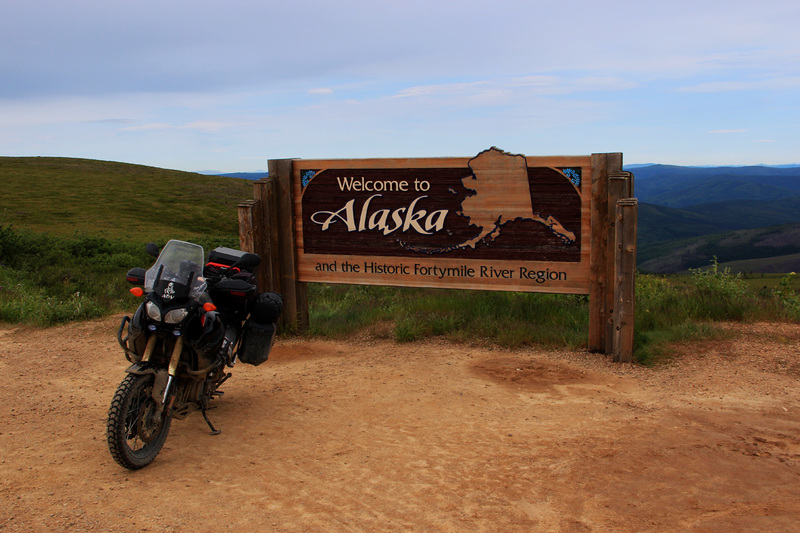 "Top of the World" highway if you can call it that and finally Alaska. George, Thanks for posting the update. I can't wait to read more about your adventure. 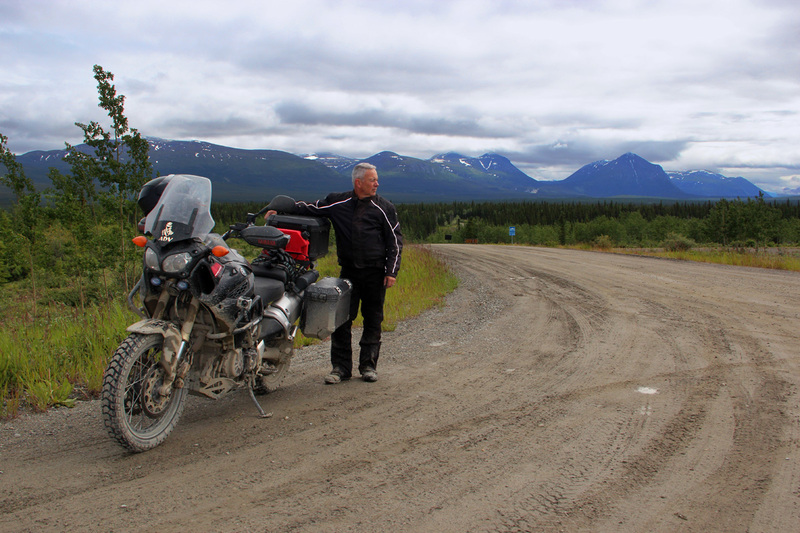 Yea, it's been an incredible adventure, so good that I had to make a detour to Calgary to have a new Heidenau K60 rear tire installed after only 7000 miles. Bob, it's difficult to find campsites with wi-fi, I found one today in Sparwood, BC. It's 9:30 and I'm sitting outside the registration office to get access to wi-fi and the damn mosquitoes are eating me alive, bloody little suckers. Thanks for the update - I am glad that you are having such a great time George. I am looking forward to the ride report when you get home. 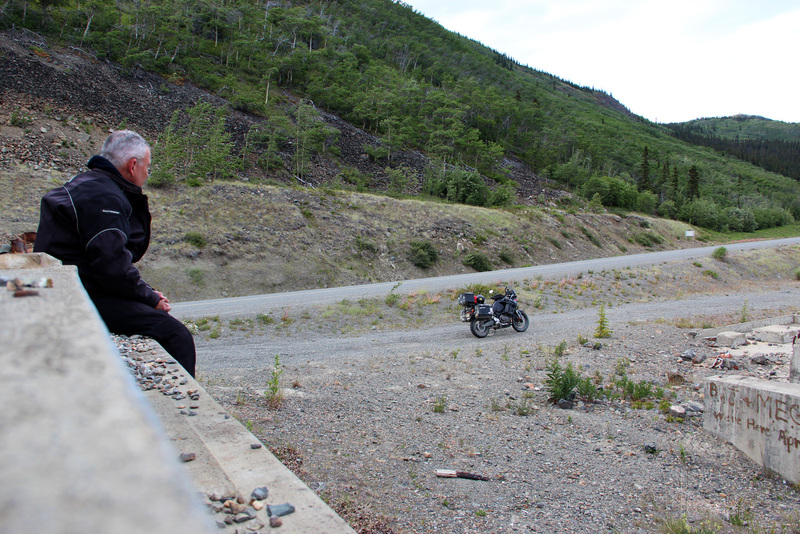 You will love riding through Jasper and Banff - hopefully not too much traffic will be in your way. And your bike looks right at home getting nice and dirty. 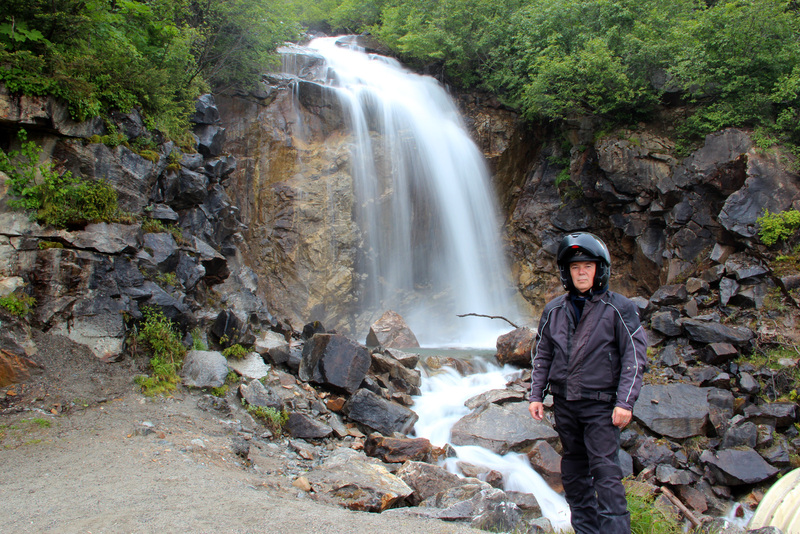 You state that, "This is my kind of adventure, miles from the main road and no one in sight." We agree! Great descriptions. Glad you're having fun and doing well after 26 days. Hope the return journey is as good as the outward journey. I really love adventure! And having a bike like that, i will do the same, ride it at the end of the world. Beautiful! Thanks for the update and inspiring pictures. Have fun!! See you when you get back. Thanks, I have so many pictures to sort through and so much to write about the experience, loving it. So good reading about your trip George, your photos take us with you - excellent stuff and a great adventure, I look forward to reading and seeing more. Stay safe. Good posts with lots of beautiful pictures are coming up soon.